I have some exciting news...wait for it...wait for it...the peeps sold the house! Yep, that means the next step is MOVING! The new house is 30 minutes away from our current house, and we're bow wow excited...the house is in the countryside on a dirt road lined with moo-ers and donkeys! Moving day is on December 29th, just three weeks away. This pup better get busy packing his 87 squeaky toys! 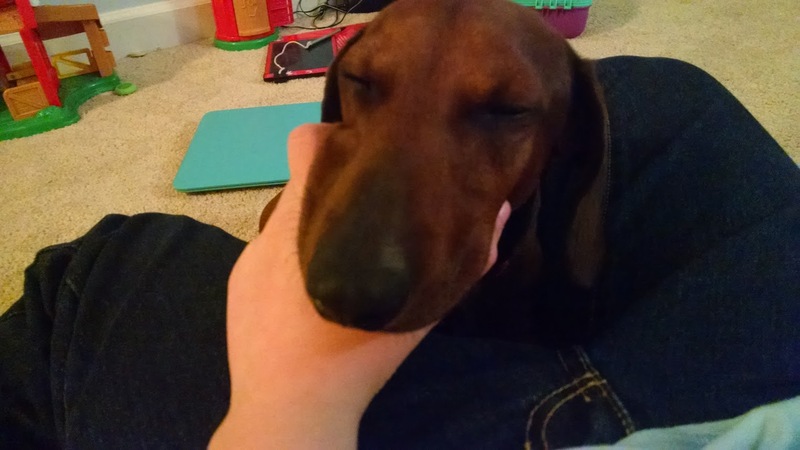 I should get some rest...mom, your hand is a great place to rest my head! What do you mean you don't want to keep your hand still for the next two hours while I snooze? Well, too bad! Oh wow, how exciting! Make sure you pack all your toys carefully. You wouldn't want them to get left behind! Maybe Frankie, Ernie, and Sarge could give you some moving tips -- they've all moved recently! You are going to be so busy i hope all your toys make it to the new house. Congrats on moving to a new and exciting house with wonderful smells! That sounds like a wonderful house. We wish we lived somewhere like that. Good luck on your move. How exciting! OMD OMD CONGRATULATIONS to you... Selling is GRRREAT... MOVING.. Not so much... it is a LOT of work... and you will SURELY need those NAPS... and SNACKS to get it done. OH that is very exciting. A move is a lot of work. Hope it all goes smoothly, especially with the holidays. OMD!!!! OH DUDE! That is exciting indeed!!!!! sounds like you;re gonna have lots of fun thingies to do! OMD, take lots of pics and notes, cause we wants to see and hear all abouts it! WooHoo!! We just love Moo-ers, we bet your new place is going to be a blast!! Oh wow! What an exciting Christmas Present. Mind you, you will all be in for a very busy time - moving can be fun but it can also be stressful and exhausting. Mom will need you to be patient with her.